DEADTIME STORIES. Ms. Dora May and her "evil" twin Ms. Libby... 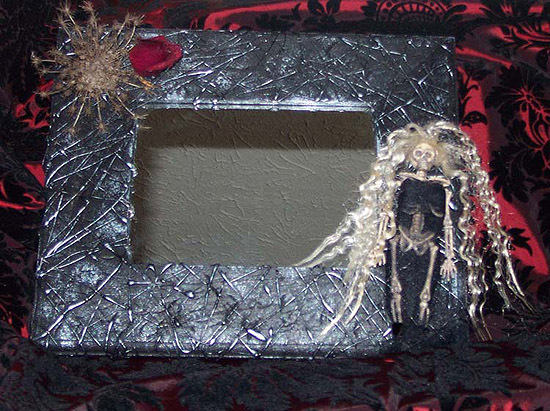 The 38th in a series of OOAK un-"Natural" creations from the dArK cobwebbed filled hemisphere of my brain. 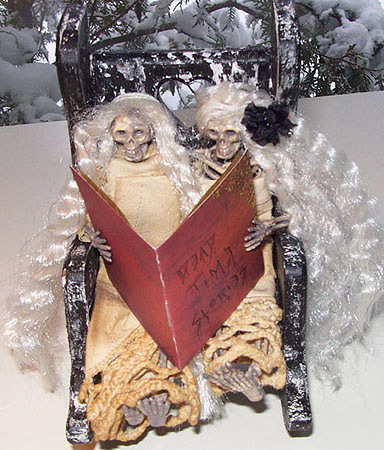 Everyone loves to settle down with a good book on a snowy day...right? Well, this inseperable duo are no exceptions! Especially since they have so much free time on their hands, because, well isn't it obvious? They're dead! FLOWER IN THE ATTIC.Master Rothchilds likes to collect pretty things.. our dearly departed Pandora...locked away & alone in the attic, the 41st in a series of OOAK un-"Natural" creations from the dArK cobwebbed filled hemisphere of my brain. 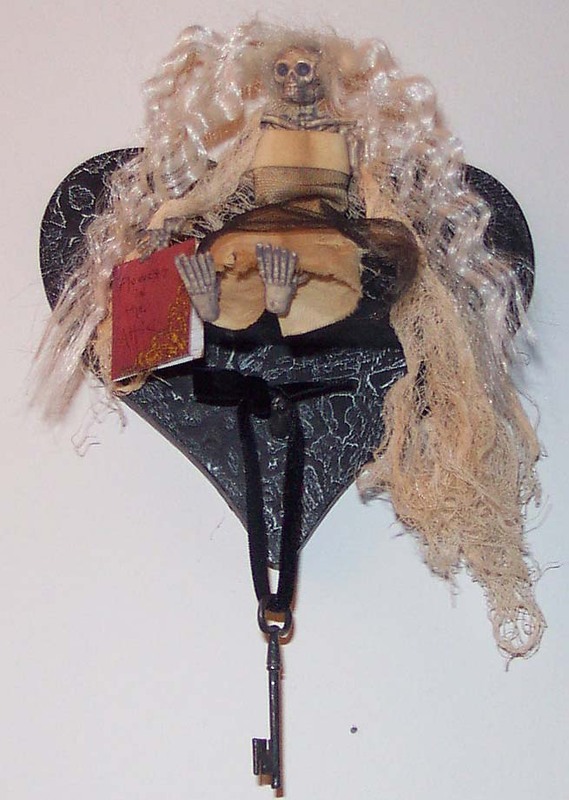 This creation consists of one "antiqued" wooden heart shaped wall adornment, measuring 6 1/2 x 6 inches . It's aged look was created with a bit of black & white acrylic paint. Adorning this shelf is the beautiful but forlorn, Pandora. 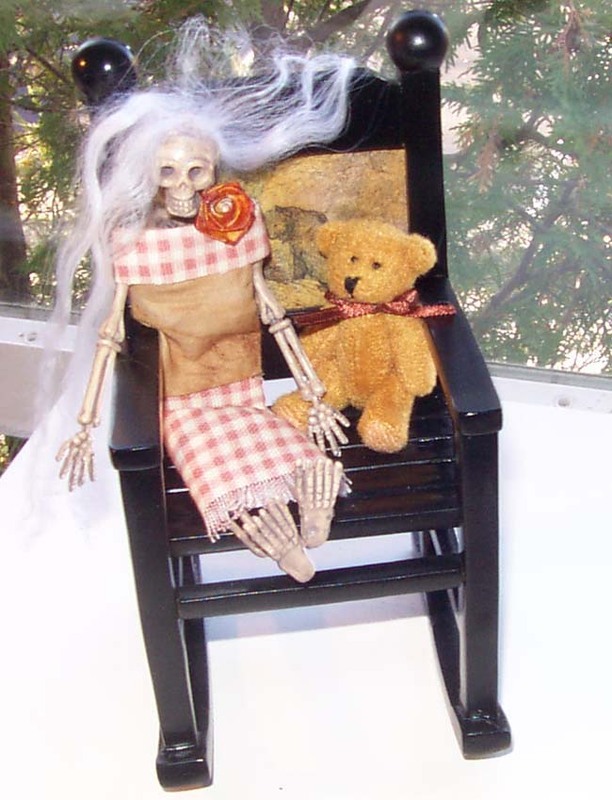 She measures about 5 3/4 inches tall and her "bones" are formed of a plastic type material, with a nice touch of age added. She is dressed in her one and only vintage "aged" cotton dress and cheesecloth shawl. In her right hand she holds a book, aptly named, "Flowers in the Attic," which she has read so many times she could recite it page for page. After all what is there to do when you have been locked in one place for all these years!! Also included is a key on a velvet rope. It is just out of her reach, believe me she has tried! She doesn't believe Mr. Rothchilds when he tells her it is the key to his heart. She believes it is the key to the attic door and her freedom! Maybe you can help her obtain that very wish!! 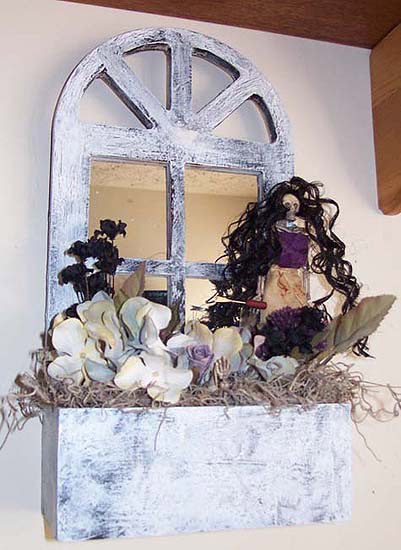 BEYOND THE GARDEN GATE--SOLD--.Dahlia Violet Merlot & her feathered fiend, Lestat..The 49th in a series of OOAK un-"Natural" creations from the dArK cobwebbed filled hemisphere of my brain. On night's when the moon's smile is full, a faint laugh can still be heard coming from beyond the garden gate. Up for auction is the old garden wall which measures 4x4x4x4 inches and 3 inches in depth and "the" black birdhouse.It measures 5 inches and from it's tip to the bottom of the wall measures 15 inches. Adorning this part of the wall is a portion of the garden, rich with dark beautiful blooming nightshade, hemlock, black ivy & weeds! Tending the garden, as always, is Dahlia, she measures about 5 3/4 inches tall and her "bones" are formed of a plastic type material, with a nice touch of age added. She is dressed in her vintage "shades of purple" dress. Completing this dark landscape is Lestat, Dahlia's avian fiend and Maurice the black widow spider. GHASTLY REFLECTION. our dearly departed Miss Lead.. She lept from her slumber, as the clock struck midnight, appropriate tools gathered, to work under the moon's pale light.. Hopefully you'll note, hopefully you'll concur, that the only pleasure for Miss Lead was to cultivate, darkly, her garden of the dead. 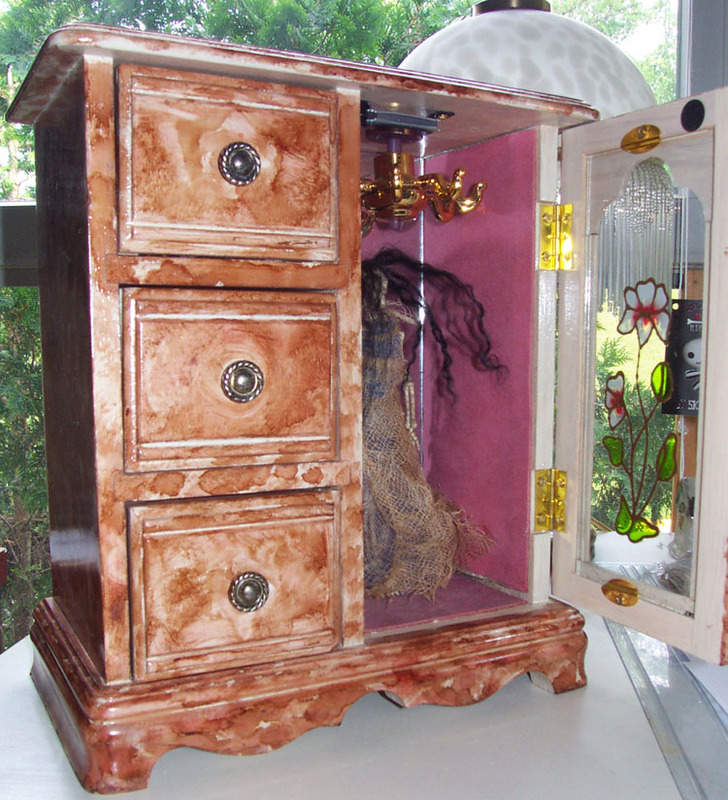 The 42nd in a series of OOAK un-"Natural" creations from the dArK cobwebbed filled hemisphere of my brain. 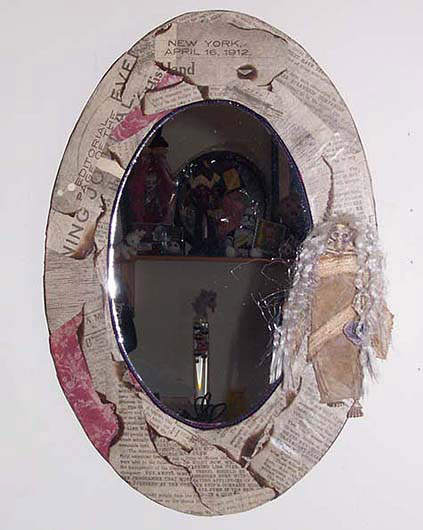 This auction is for one "antiqued" wooden & mirrored wall adornment, measuring 14 x 7 inches. It's aged look was created with a bit of black & white acrylic paint. Adorning this creation is the beautiful Misled. 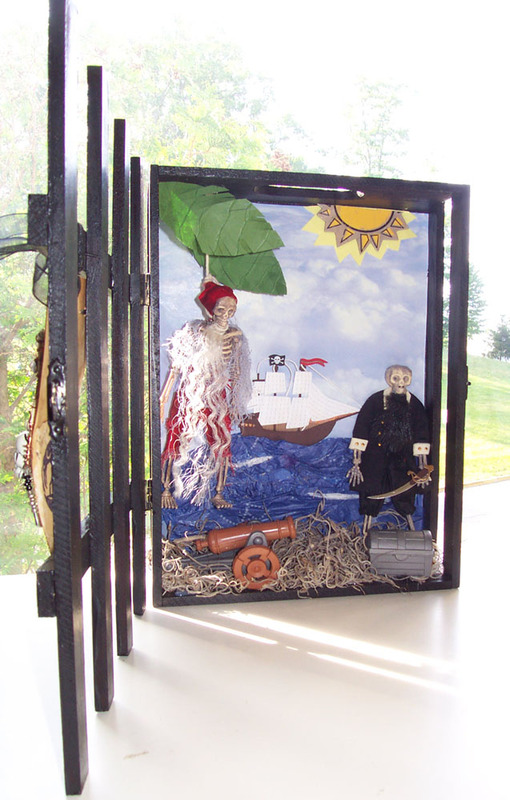 She measures about 5 3/4 inches tall and her "bones" are formed of a plastic type material, with a nice touch of age added. She is dressed in her favorite dress, a deeper shade of purple. She also wears her "gardening" apron (please ignore the blood) and in her right hand she holds her favorite tool of the night. THE PLAYROOM - SOLD 7/07 .Epiphany Angela Payne & her fiends Hitchcock the rocking horse & Poe, the teddy bear... The 47th in a series of OOAK un-"Natural" creations from the dArK cobwebbed filled hemisphere of my brain. On night's, not unlike tonight, when the moon's smile is full, a faint laugh can still be heard coming from the children's playroom, at the end of the hall, of the old Payne estate. 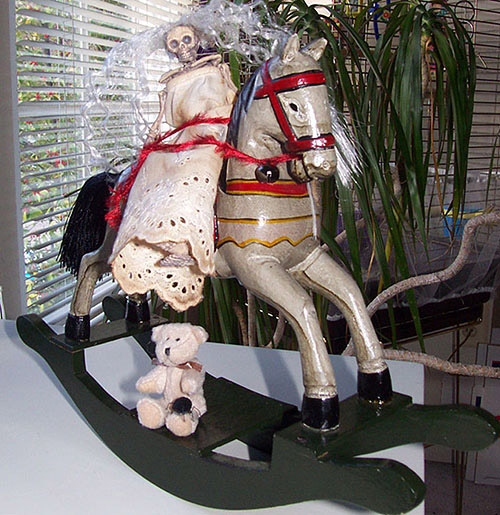 Up for auction is an old wooden rocking horse, his rider, Epiphany and her bear, Poe. Hitchcock, the rocking horse originally hailed from the People's Republic of China but Epiphany found him broken by the wayside (here, somewhere, in the old USA (he measures- 11 x 8 1/2 inches). He was a sad pony as he had no reigns and somehow had lost his tail. She took him home and with a little help, he is, as you see him today. Epiphany measures about 5 3/4 inches tall and her "bones" are formed of a plastic type material, with a nice touch of age added. She is dressed in her vintage "aged" dress. Underneath her, sitting on the bottom of the rocking horse is, her favorite bear, Poe, and spider pal, Renfield. Please note there is a bell attached to Hitchcock's reign, just to let you know when they are rocking away after midnight!! MOURNINGSIDE CEMETERY GARDEN--SOLD--. after the clock strikes Midnight...Elizabeta Alexandra & her feathered fiend, Poe.. 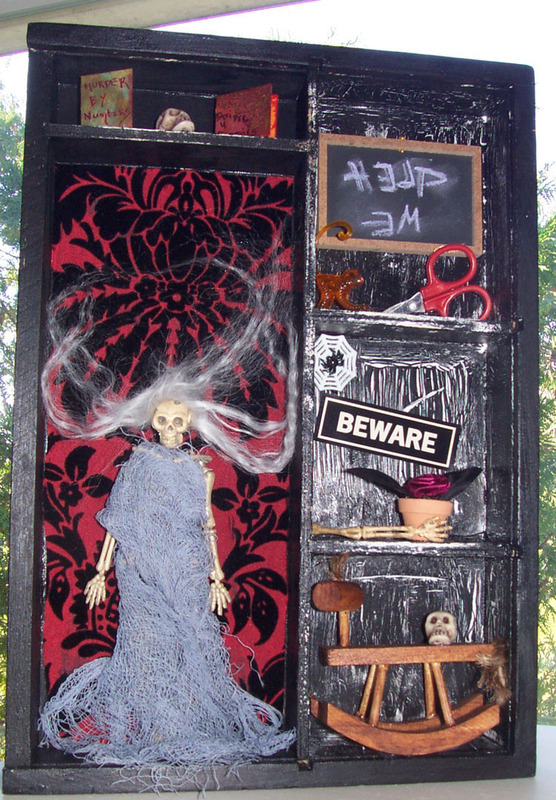 The 46th in a series of OOAK un-"Natural" creations from the dArK cobwebbed filled hemisphere of my brain. On night's when the moon's smile is full, a faint laugh can still be heard coming from the garden of the Mourningside Cemetery. The old wooden swing still hangs from the oak tree overlooking the now, unkept garden. The new owners of the cemetery don't keep up the once lush area as they feel their clients don't really care about it, because, well, they're dead. Back when old man Scrimm owned the cemetery, it's gardens were his pride and joy, besides his daughter Alex. Unfortunately at the age of 9, Alex's life was snuffed out by a mysterious fire in the mortuary and things were never the same. Later the same year Scrimm took his life and shortly thereafter the Mourningside Cemetery was bought by people who just cared about money. There were rumours that the fire was set on purpose and the intended victim was suppose to be be old man Scrimm, himself. 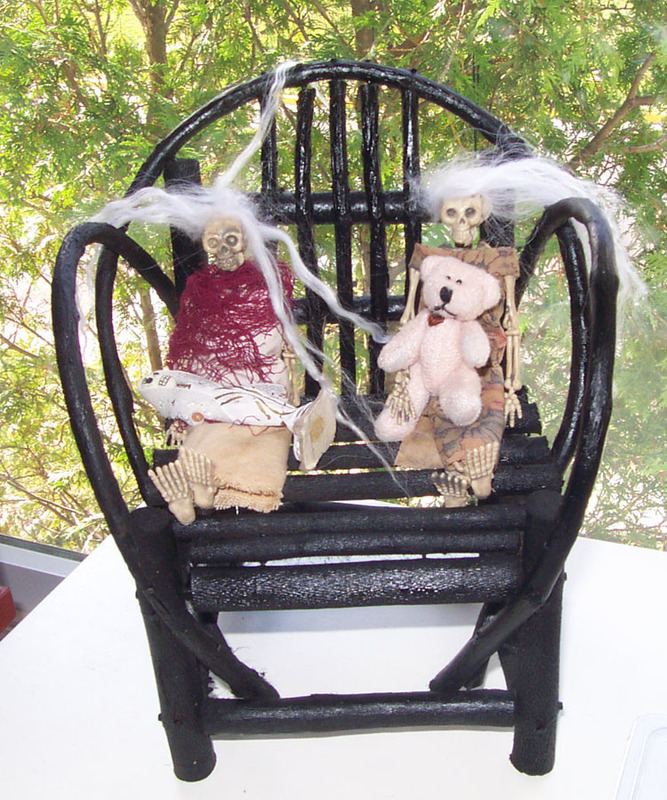 Up for auction is the old wooden swing, it measures 7 3/4 x 4 1/2 inches- 20 1/4 inches hanging length. Adorning the left hand side of this piece is sweet little Alex, herself. 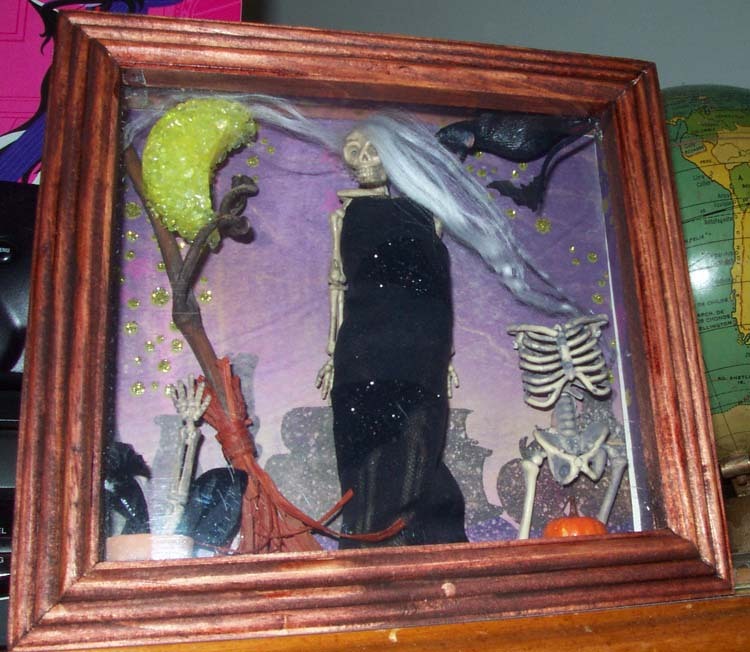 She measures about 5 3/4 inches tall and her "bones" are formed of a plastic type material, with a nice touch of age added. She is dressed in her vintage "aged" dress and cheesecloth jumper. She also wears a silver heart & star necklace her father had given her when she was 5 years old. 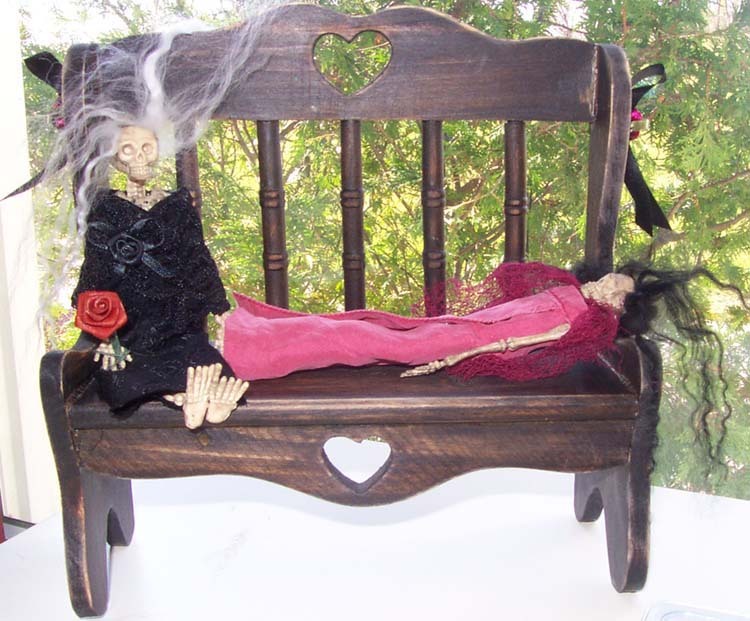 (Ignore that skull sitting on the swing next to her, umm, it's not real). On the other side of the swing sits her fiend, Poe, who carries a faded rose from the garden. Not shown in the photo's but behind them on the swing are a few black flowers and another purple/silver faded rose. Completing this swing is s tag with the name of the cemetery garden, embellished with a black ribbon. 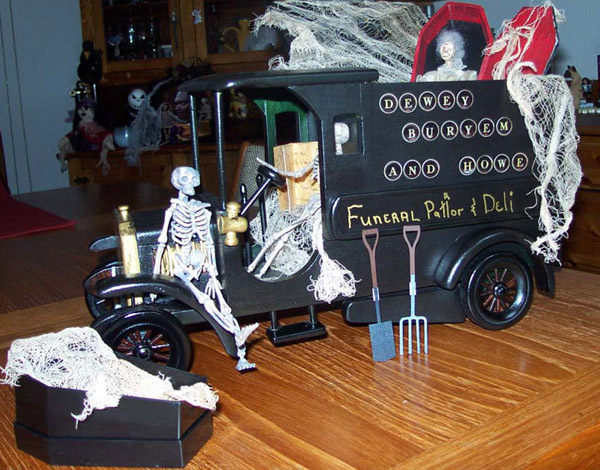 Last, but not least is another black ribbon on the top of the swing and a piece of red raffia which holds a rusty bell and a skull bell. 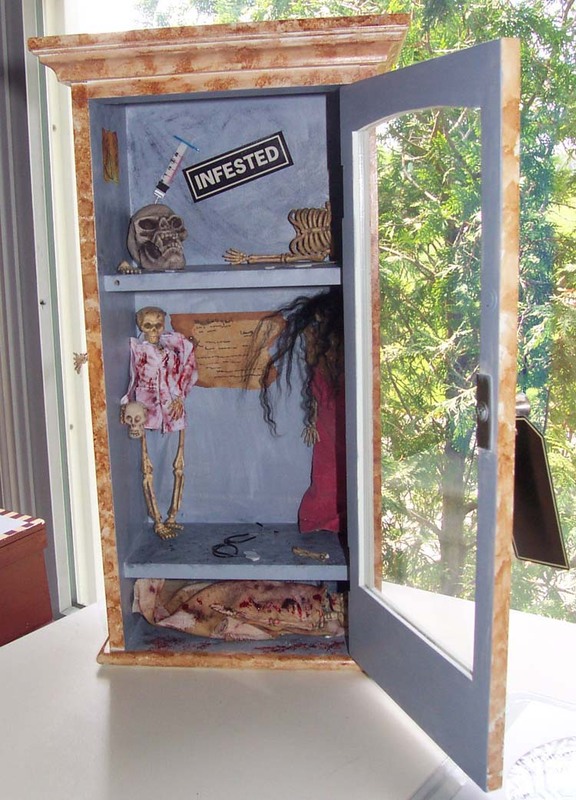 They're there just in case Alex's spirit stops by your abode....... you'll know when she is lurking about the premises.